Although Charles Patterson (1852-1928) did not obtain title to Subs. 91 and 92, Portion 29 (1 rood 20.8 perches), until 4 October 1889, the listing of Patterson’s Sub. 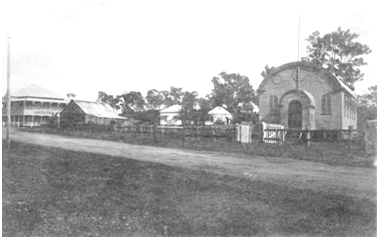 91 blacksmith shop in the 1887 Caboolture Divisional Board Land Valuation in the Pine Rivers area indicates that he had been occupying the area prior to this date; his obituary states that he purchased the land in 1885 when the area was first subdivided by Tom Petrie. An 1886 newspaper article noted the presence of “the blacksmith so indispensable to the country village”. The business was continued from about 1929 by Charles’ son, Bob (Robert Charles) Patterson (1897-1942). Bob Patterson continued operating the business until his untimely death on 15 October 1942. The blacksmith shop, located as it was in close proximity to the North Pine Hotel, was a popular meeting place for the menfolk who would gather there to discuss news of local happenings. Patterson’s Blacksmith Shop can be seen at the left to the right of the North Pine Hotel. Moreton Mail, 27 March 1886.